To achieve a high degree of subjective safety and through this convince the whole population to cycle, cyclists need to be kept away from motor vehicles. A comprehensive network of cycle-paths, as seen here in Assen, is a particularly good way to do this. In the video we cross the ring-road around Assen (there are many other crossings including here, here and here), go throught a residential area and leave the city by crossing the path of a motorway until we reach the edge of the first village (which featured in an earlier blog post). The cycle-path is continuous. In fact, this is only a very small part of it, and it's continuous for a long distance both before and after that shown. This infrastructure is not named a "superhighway". In fact, it's not named in any special way at all as no-one thought it significant enough to put their name to it. It's "just" a standard Dutch cycle-path, one of many which make up the comprehensive grid which criss-cross the city and make mass cycling possible for everyone. En-route, you'll see many children on bikes. Also we pass a school entrance. You can't see the extent of the parking at this school from this video. Click on the link on the right to see more. Speed limits on the roads nearby vary. At first we parallel a 50 km/h road. The ring-road which we cross has a speed limit of 70 km/h. All roads in the residential area have a speed limit of 30 km/h, and even though traffic is light because there are no through roads in this area there is still a cycle-path which provides continuity and directness for cyclists. The motorway has a speed limit of 120 km/h and then we ride parallel with a main road in the country which has a 60 km/h speed limit before the speed limit reduces to 30 km/h in the village. There is a separate cycle-path through the village too. The route in the video is from A to B taking the blue line which is direct and provides consistent high quality inside and outside the city. 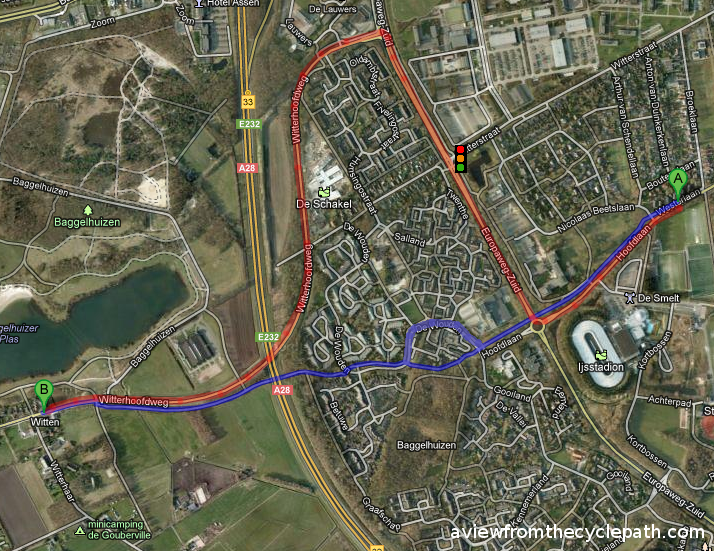 Cars must take the red route, 3.5 km long and including a crossing which prioritizes cyclists. Read more blog posts about how cyclists in the Netherlands make more direct journeys than drivers by avoiding traffic lights, or more about cycle-paths, or about how segregation is possible without cycle-paths, about school travel or many other things (see links to articles on particular themes on the right of every page, tags for posts at the bottom of every page). This video resulted from running a camera as I rode around the route of the last study tour a few days before it started. However, I thought it showed enough interesting stuff to be worth showing here. We've been running study tours since 2006. We started doing this it became obvious to us that there was a rather large gulf between what was thought in the UK, where we then lived, to be best practice in infrastructure for cyclists and what was everyday normality in the Netherlands and used by millions of people every day of the year. This blog started as a supplement to the tours. It was a way of keeping people who had been on the study tours up to date with new developments, and to try to stop people who had been on the tours from returning to their normality and forgetting how significant what they had seen was. In September, six people from Britain came on the September study tour. Each time we've done a tour it has been different and this was no exception. Our knowledge grows so we have more to tell, but that's not the only reason. The Netherlands is not standing still and the infrastructure improves between each tour. Approximately half of everything seen in the first tour has been replaced, resurfaced or redesigned since the first tour that we ran here. There is no option to stand still when things change so rapidly. Older residential streets - demonstrating how they do not operate as rat-runs because of a one-way system for cars which prevents through traffic. Also the low speed limit (30 km/h) and noisy road surface help to keep residential streets as places for people. Cyclists can of course use all these streets in any direction so they also provide an example of unravelling of cycling routes from motor routes. Heading out of the centre on a wide & smooth cycle-path. Near 100% Separation of cyclists from cars is vital to achieve the high degree of subjective safety necessary to get the whole population cycling, and without the whole population it is impossible to achieve a high cycling modal share. The most extreme woonerf in Assen. This is a residential development from the late 1970s / early 1980s. These homes are still popular, but modern developments look different. Woonerven are not designed to operate as through routes for cyclists or drivers. Cycle-path between Assen and an outlying village. Resurfacing work due to tree root damage. In a modern development a wide network of cycle-paths give cyclists an advantage of more direct routes than can be taken by car. The school run is always interesting. Wide cycle-paths like this are the necessary infrastructure which makes it possible for young children to cycle unaccompanied. No amount of training can achieve this without the infrastructure. Routes used by school children always have litter bins which collect most of the rubbish. The width of cycle-paths in this area makes it possible for a group to stop and look at the bins without causing much of a problem. The new cultural centre (library, theatre, cinema, concert halls) in Assen has indoor guarded cycle parking. You can walk from the cycle-park directly into the theatre without having to go back outside. It's free of charge and it's open from early in the morning until after the last performance finishes. If you have a problem with your bike then depending on the time of day, the staff can often arrange to fix it before you leave. A cycle by-pass. Four kilometres long and four metres wide, this cycle-path allows high speed cyclists to avoid going through the centre of the city, and also connects some of the outlying suburbs. There is no shortcut to a high modal share. It won't come about due just to "soft measures" such as training and it won't come about by campaigners and planners aiming low. The Netherlands achieved the highest cycling modal share in the world, and continues to build on this success, by building the best cycling infrastructure in the world. This gives people the highest possible degree of subjective safety as well as very convenient journeys by bike and that is what makes cycling an easy choice for the whole population. Cycling modal shares correlate well with the degree of investment in cycling and the Dutch spend more on this than any other nation. €30 per person per year. However, it has been shown that even with what some people might consider to be "gold plating" of the infrastructure, cycling infrastructure is cheaper to build than not to build. Any nation could do this and any nation could reap the same rewards. The photo on the right, from the Crap Waltham Forest blog, shows how High Road in Leytonstone in London has been transformed to move car parking off the road. This has resulted in narrowing of the carriageway and a worsening of conditions for cyclists. Click on the link for more details of the harm that is being done as well as comments about the continuing confusion of some cycle-campaigners in the UK about what works to increase cycling modal share. 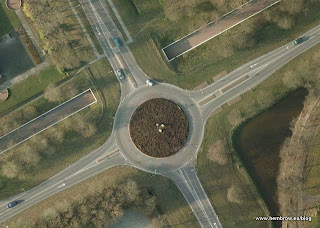 On the face of it, this is an application of the same idea as I blogged about a few weeks ago having seen it adopted more frequently throughout Assen. However, there is a fundamental difference. In the Netherlands, this is a technique used to civilize residential streets which are not busy through roads, which do not have a high number of motor vehicles passing through and which have a 30 km/h speed limit. In the UK the same thing is being done on busy through roads with higher speed limits and lots of traffic. Context is important. This concept, and others like it, can only work properly if they are implemented in the right places, and from the point of view of a cyclist, the implementation in London is definitely not happening in the right places. On the face of it, this is yet another case of the fundamental principles of a good idea in effect being "lost in translation" as it travels across the North Sea. Update Freewheeler provided more context and explanation of the first photo.